We are often asked by prospective aquarium owners, architects and interior designers to help design aquariums for their projects. To help with this process, we have produced this article based on our long experience of using aquariums made from both materials, and hopefully we can help you to decide on one of the most popular initial questions we get asked – is glass or acrylic the better material for our aquarium? There are many factors which will be involved in your decision on this, but we have discussed through everything we know on both type of materials, which will no doubt include some surprising benefits & negatives of each!! The first factor we should get out of the way is cost and pricing. This one is easy to answer – acrylic aquariums are more expensive to buy than an identical sized glass aquarium. Once you start thinking about very large aquariums, acrylic becomes way more expensive – many of the largest aquariums installed in the UK have been sourced from USA. We believe this is for two reasons – firstly the US has the ability to create much bigger tanks in house than any UK company. Secondly, acrylic is much more widely used in the US for all sizes of tanks, and this results in many more suppliers than we have in the UK. The second factor to consider is shape, and this is where acrylic comes into its own. Glass can be bent and curved, but only to a limited degree, and so this results in limited options for shape with a glass tank. Acrylic is much more flexible, and all sorts of curves, bubbles, spheres and cylinders are possible. If you are wanting a very unusual or bespoke shape, then acrylic may be the only way forward. The third factor in your decision is longevity (and scratching!). Acrylic tanks are much easier to scratch then glass, and this is the major negative of acrylic. Although scratches can be polished out on an acrylic aquarium, these are often on the inside of the tank caused by cleaning, and so this involves draining the tank for the repair. This is obviously not ideal, especially if the tank is a marine reef aquarium – these are very hard to break down and rebuild! Glass tanks are not as susceptible to scratching, but if you are not careful they still can be scratched. Glass scratches can be polished out (ask us for details if you would like to know more), but generally this is only sensible on the outside of the tank. If you polish out a scratch inside the tank, after a period of months we have found that the repaired area takes on a haze due to the repair process and ongoing contact with water. The outside of the tank however can be repaired quite easily with no longer terms concerns. The fourth factor is the corners and seams on the aquarium. Acrylic aquarium are glued together, and this can be done invisibly in the corners so that your view of your tank is uninterrupted. 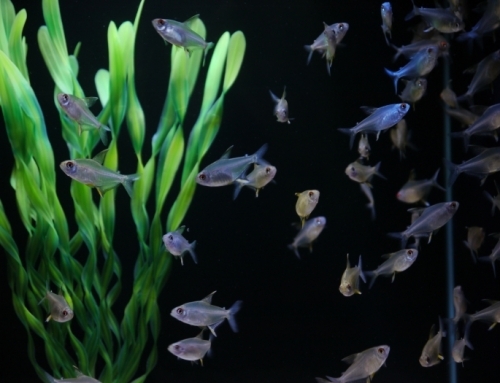 Glass aquariums are always constructed with silicon sealant, and this generally comes in black or translucent options. Translucent is the most invisible when the tank is first built, but silicon as a habit of absorbing fish treatments (which are often very dark blue or green), and as such they take on a coloured appearance once a treatment has been used. The alternative is black – although this will stand out more at the beginning, it will stay as it was constructed and will not fade or discolour. 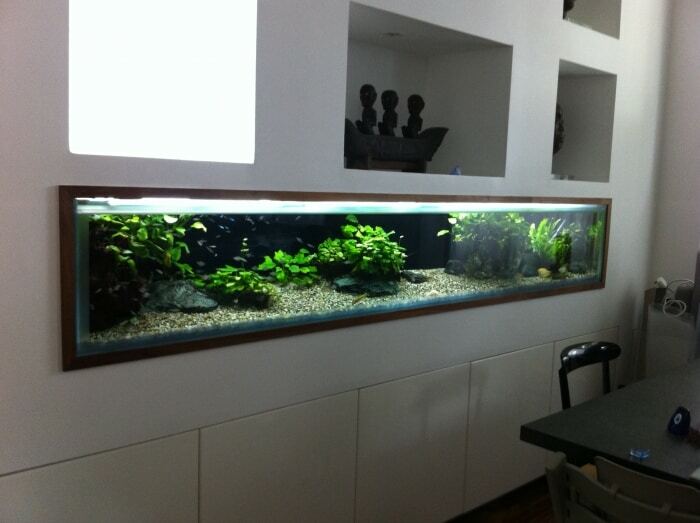 Therefore black is often considered the better option for an aquarium by many of our clients. Practicality should also be considered when choosing. If you would like to have pipework going through the base or the sides of the tank, this is possible with both materials. With glass, you need to specify at the time of construction where you would like the holes, as it is safer to drill these holes prior to the tank being assembled. As acrylic tank can be drilled at any time, and so additions of pipework to the tank are easy to add at any time. 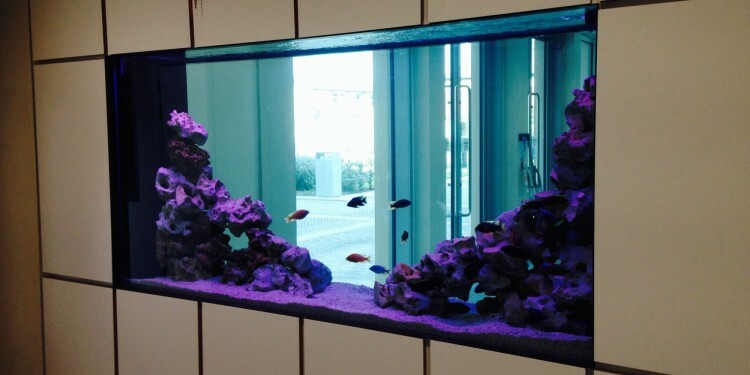 Acrylic aquariums are also much lighter than glass, so manoeuvering them is easier when installing. In reality, we think weight is a very small factor to consider! The last question, and most frightening of all is ‘do they ever leak?’ We would be lying if we said no, as we have known tanks made from both materials leak, but in very different ways. We have known acrylic tanks actually explode under the pressure years after installation, and drain the entire contents in seconds!! We have never known a glass tank fail in this manner, but we have experienced silicon bonds stretch and start to leak water out, albeit very slowly. None of these options is ideal, but out of the two, glass gives you more time to deal with the repair. As with any situation, the quality of the initial aquarium construction plays a major part in this, and so we would recommend always using a high quality manufacturer. Although we are not biased one way or another (we use both! ), we prefer glass where practical, due to the lack of scratching – for us this is the biggest negative issue we experience with acrylic, and makes it very difficult to maintain in the longer term. We are sure that the above article has been helpful to you in deciding which material you should use for your new aquarium, and if this has raised any more questions you would like answered, then please do get in touch and we will be happy to help.